Seventy Seven Energy Inc. missed analyst expectations on Monday and reported a first-quarter net loss of $59.6 million, or $1.09 a share, as reported by Adam Wilmoth of The Oklahoman. 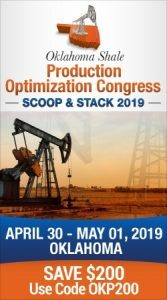 The Oklahoma City-based oil field services company’s first-quarter earnings were down from a net loss of $37.6 million, or 78 cents a share from a year ago. Total revenues fell to $155 million, down 19 percent from almost $193 million one year ago. Adjusted earnings before interest, taxes, depreciation and amortization were $37.9 million, down from $56.3 million in the first quarter of 2015. Adjusted for one-time expenses, Seventy Seven posted a net loss of $55.1 million, or $1.01 a share, compared to an adjusted loss of $21.6 million, or 45 cents a share, in the year-ago period. The adjusted earnings missed consensus analyst expectations of a loss of 83 cents a share. Last week, the company announced plans for a prepackaged bankruptcy reorganization. Executives reached a $1.1 billion financing plan with most of its lenders and said it expects to file for Chapter 11 bankruptcy protection next month. 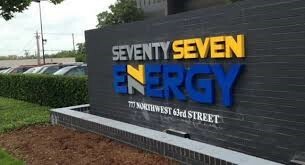 Seventy Seven spun off from Chesapeake Energy Corp. in 2014. Chesapeake still represented 61 percent of Seventy’s Seven’s drilling revenue in the first quarter. Like most oil and natural gas producers, Chesapeake slashed its 2016 drilling budget because of low oil and natural gas prices. The company finished the first quarter with $74.7 million in cash and working capital of almost $133 million. Seventy Seven shares were down one cent, or 5.5 percent, to 23 cents a share at Monday’s closing bell.